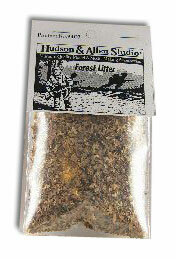 Hudson & Allen FOREST LITTER is a mixture of natural and synthetic materials, which can be used to model the dead leaves and forest detritus found on forest floors and at the base of deciduous trees. Modeling a realistic ground cover for forest or other leaf-covered areas has always been a difficult prospect. The lack of small leaf shapes leaf a lot to be desired from most modeler’s efforts. This product evolved from experience as museum exhibit builders and has been refined over a period of years. It is now available to you to use anywhere you wish to simulate realistic ground cover in a wooded setting. FOREST LITTER comes ready to use and requires no painting. Simply apply a small amount of white glue to the area of your model where you wish to place the litter. While the glue is still wet, sprinkle the FOREST LITTER over the glue and allow to dry. It may be necessary to spray more diluted glue over the litter to anchor loose particles. You may wish to arrange the litter so the larger leaf-like particles are at the top. This can be done by putting the FOREST LITTER in a box and shaking out the smaller particles to place on top of your litter pile. When completely dry, you may wish to seal the litter with a flat, clear sealer. FOREST LITTER looks great at the base of trees, in low laying areas and ditches, but use your imagination to find other uses. Use the material in this set with or Hudson & Allen IVY to create a dead vine or use the brown leaves in the set with the green leaves in our ivy to make a really nice looking camouflage net for your armored vehicle. The possibilities are endless. MODELING TIP: Add a drop of dish detergent to your white glue mix for better wetting action. You may also wish to add a few drops of a disinfectant to prevent mold growth while drying.